The following is a recap of official action taken by the Board of Supervisors for the University of Louisiana System. Board Chair E.G. “T-Boy” Hebert of Kenner and Parliamentarian Edward Crawford III of Shreveport were installed today for a second consecutive leadership term on the UL System Board of Supervisors. Board Vice Chair Jimmie “Beau” Martin, Jr. of Cut Off was unable to attend and will be installed at the February meeting. 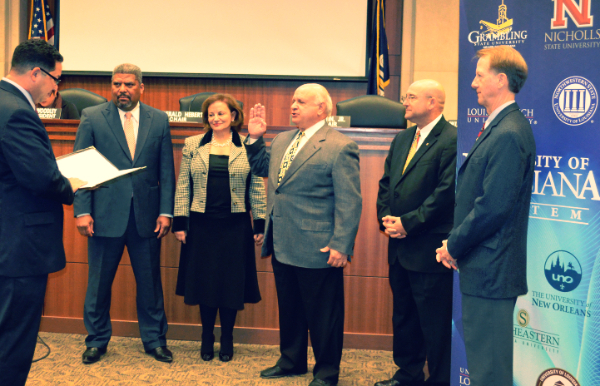 This week, Governor Bobby Jindal reappointed Crawford and David Guidry of Natalbany to the Board, as well as appointed two new members, Pamela Egan of Covington and Shawn Murphy of Jonesboro. Egan, who replaced Andre Coudrain as a District 1 representative, formerly served on the Louisiana Board of Regents. She is the owner of Egan Wellness Clinic and a graduate of the University of Louisiana at Lafayette and the LSU Health Sciences Center. Murphy, who replaced D. Wayne Parker as a District 5 representative, is a 30-year agent with State Farm Insurance. Both he and his wife are graduates of Northeast Louisiana University, which is now the University of Louisiana at Monroe. Click here for a list of the 2015 Standing Committees appointed today. UL System Board Chair E.G. “T-Boy” Hebert today appointed Board Members Dr. Kelly Faircloth of Pineville and Shawn Murphy of Jonesboro to the Grambling State University Presidential Search Committee. Faircloth and Murphy replace former members Andre Coudrain and D. Wayne Parker. Additionally, Grambling alumnus and current Principal of Scotlandville Magnet High School in Baton Rouge, Howard Davis, was added as an advisory member. For the updated committee list and other search information, visit www.ulsystem.edu/GramblingSearch. UL System Board Members and staff participated in a live ethics training following today’s board meeting. The training was conducted by Brett Robinson of the Louisiana Board of Ethics. As this is an annual obligation for board members and state employees, those who were unable to participate can complete the training online by clicking HERE.